1. Mads Sogaard, Medicine Hat Tigers: 2019 NHL Draft prospect Mads Sogaard of the Medicine Hat Tigers recorded his fourth-straight win Sunday as the Tigers took down the Portland Winterhawks 2-1 in a shootout. Sogaard stopped 32 of 33 shots through regulation and overtime. The Winterhawks then went scoreless on five attempts in the shootout. The Aalborg, Denmark product now has a 15-4-2-2 record, 2.19 goals-against-average, 0.935 save percentage, and three shutouts. 2. Chase Wouters, Saskatoon Blades: Saskatoon Blades captain Chase Wouters scored twice Sunday, sending his team to a 6-3 win against the visiting Brandon Wheat Kings. Wouters scored the third and fourth goals of the game for the Blades, securing the game-winning goal with his second of the night. The Lloydminster, Alta. product now has 30 points (12G-18A) in 55 games this season with the Blades. He also has 102 points (36G-66A) in 183 WHL regular season games. 3. Andrew Fyten, Edmonton Oil Kings: Edmonton Oil Kings forward Andrew Fyten scored once and added a pair of assists in a 5-2 win against the Regina Pats Sunday. Fyten had the fourth goal of the game for the Oil Kings, picking up assists on the team’s third and fifth goals. The Sundre, Alta. product now has 31 points (13G-18A) in 47 games this season. In 231 WHL regular season games, Fyten has 73 points (30G-43A). Two-goal games from captain Chase Wouters and Riley McKay powered the Saskatoon Blades to their fourth-straight victory Sunday in a 6-3 decision against the Brandon Wheat Kings. McKay and Wouters tallied their first goals of the night in the opening period while Kyle Crnkovic added a strike as well to make it 3-0 after 20 minutes. The Wheaties responded in the second with goals by Linden McCorrister, captain Stelio Mattheos (Carolina Hurricanes), and Ridly Greig, but Wouters’ second of the night kept the Blades in front by a goal heading to the third. The Blades would add to their lead in the third with Dawson Davidson’s 11th of the season and McKay’s second of the game. Nolan Maier stopped 25 of 28 shots in the win. Max Gerlach added three assists in the win while Tristen Robins added a pair of helpers. Davidson added a helper of his own for the multi-point game. A goal and an assist each from Riley Stotts (Toronto Maple Leafs), James Malm, and Kaden Elder led the Calgary Hitmen to a 6-2 win against the Moose Jaw Warriors Sunday. Carson Focht added three assists while 2019 NHL Draft prospect Jackson Van De Leest had a pair of helpers in the win as the Hitmen spread out their scoring evenly with a pair of goals in each period. Captain and 2019 NHL Draft prospect Mark Kastelic, Cael Zimmerman, and rookie Tye Carriere also scored in the win while Carl Stankowski stopped 20 of 22 shots in the win. Warriors’ captain Josh Brook (Montreal Canadiens) and Keenan Taphorn had goals for Moose Jaw in the loss. The Edmonton Oil Kings put themselves back into the win column Sunday with a 5-2 decision against the Regina Pats, ensuring they’ll take their lead in the Central Division into the coming week. 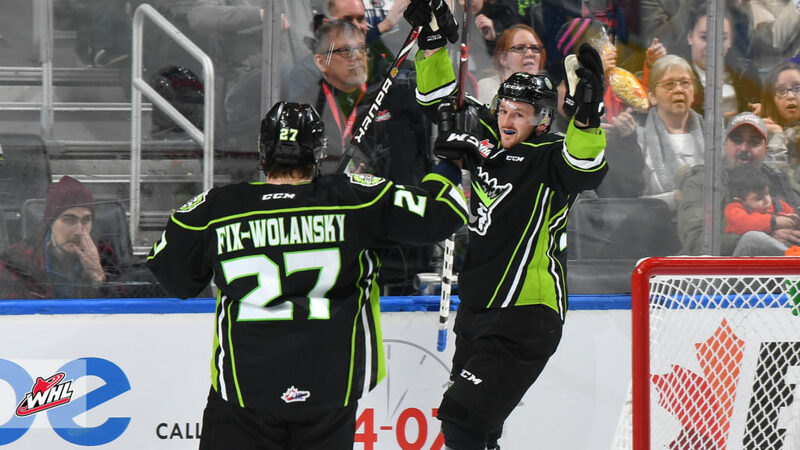 Andrew Fyten had a goal and two assists while captain Trey Fix-Wolansky (Columbus Blue Jackets), 2019 NHL Draft prospect David Kope, and Scott Atkinson each had a goal and an assists in the win. Carter Souch had the other goal for the Oil Kings, who became the eighth WHL team to reach the 30-win plateau with the triumph. Trailing 1-0 after 20 minutes to the Pats, the Oil Kings scored three times in the second and twice in the third. Austin Pratt and Logan Nijhoff had goals for the Pats in the loss. Dylan Myskiw stopped 34 of 36 shots for the win. Max Paddock stopped 40 shots in the loss. The Vancouver Giants confirmed their spot in the 2019 WHL Playoffs with a 4-1 win against the Prince George Cougars. David Tendeck (Arizona Coyotes) led the way with 32 saves on 33 shots while Davis Koch netted the game-winning goal and 2019 NHL Draft prospect Bowen Byram added a pair of assists. Koch would add a helper for the multi-point game. Ethan Browne had the only goal through 20 minutes as the Cougars led 1-0 early on. The Giants would responded with four unanswered goals though, kickstarted by Jared Dmytriw 42 seconds in to the second. With both teams tied to start the third, the Giants poured on goals by Koch, Justin Sourdif, and Tristen Nielsen to close out the win. Each team scored once on the power play in Sunday’s contest. 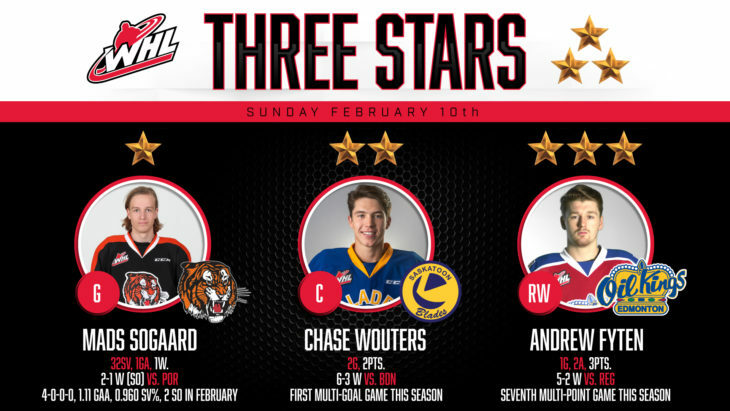 2019 NHL Draft prospect Mads Sogaard conceded a goal to fellow countryman Joachim Blichfeld, but was perfect otherwise as the Medicine Hat Tigers earned a 2-1 shootout win against the Portland Winterhawks Sunday. Sogaard stopped 32 of 33 shots in regulation and overtime before denying all five Portland attempts in the shootout. Shane Farkas delivered a near perfect effort as well, stopping 38 of 39 shots in the first 65 minutes before allowing a single goal on five shootout attempts as 2019 NHL Draft prospect Ryan Chyzowski scored the shootout-winning goal. Blichfeld got the Winterhawks on the board 10:23 into the game and it wouldn’t be until the third when the Tigers answered via the stick of Ryan Jevne, whose short-handed goal was his 25th of the season.